Those of you that have been following my facebook page for a while, would know that the #StopTheBeautyMadness campaign is something that is right up my alley. Created by Robin Rice after she had decided that she, and many others, had had enough of the ‘impossible standards’ placed upon women by the beauty industry. Usually I would just share the link to the website with you on my page, bt this is something I feel so strongly about I wanted to share in more ways than one. 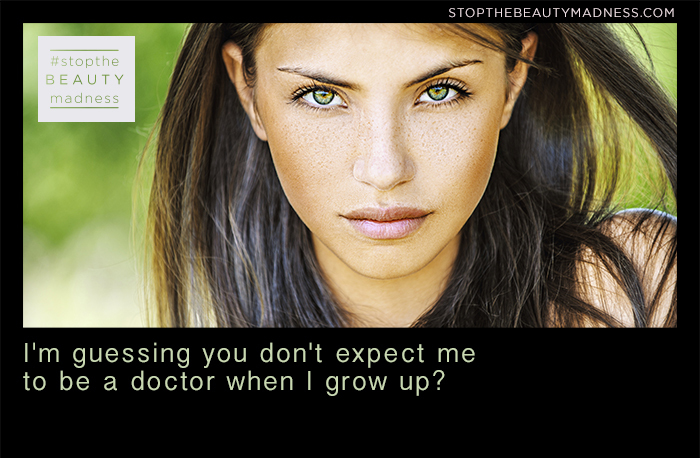 So what is #StopTheBeautyMadness all about? It is about waking us up to the ridiculous standards that are placed up on us- by ourselves, by the beauty industry, or via social media- to realise that these things are not actually the secrets to true beauty. Below are just some of the images that really connected with me- but you must go check out them all out yourself and then let me know which ones resonate with you? When I used to tell people I was going to be a vet (or studying veterinary science), 9 times out of 10 the response I would get would be…’Oh to be a vet nurse’. Now don’t get me wrong- I love my vet nurses and I wouldn’t be able to do my job without them. But this comment irked me every time..was it my gender, my hair colour (which was blonde then) or my appearance? Regardless of which it was..there was a common theme where people’s initial impression was that I wasn’t going to be a veterinarian. I think everyone feels scared the first time the walk into the gym. It took me years and years to join a gym for this very reason. What I hope to inspire in the MBSTers is that it doesn’t matter how slow you go, what you wear, what you look like- all that matters is that you are having a go! Haha do I even need to comment on this one! You all know how I feel! If I want muscles, if I like muscles..I will have muscles and it will make me no less feminine or beautiful! Just want to say thankyou to you for writing this post. So many points and issues that need to be made more publicly aware! Thank you! I completely agree!! Love this post! Sometimes I think it can be forgotten that we’re actually all human! And who even decides what perfect is anyway, who has that right??? Keep it up!